Image your favorite TV show or video game without its soundtrack. It loses its appeal pretty quickly, right? It’s been said that music is what emotions sound like, and no matter the activity of media, music enhances the experience. We in the music industry have a responsibility to make sure we never have to live in a world without music. And, with that in mind, our most important mission is to make more musicians. Springtime is here, which means schools are making their end-of-year push to encourage next year’s beginning musicians. Students are dreaming of summer and teachers are making plans for next year. As part of that planning, music teachers all across the state partner with Ted Brown Music to help recruit new musicians for their classes in the fall. 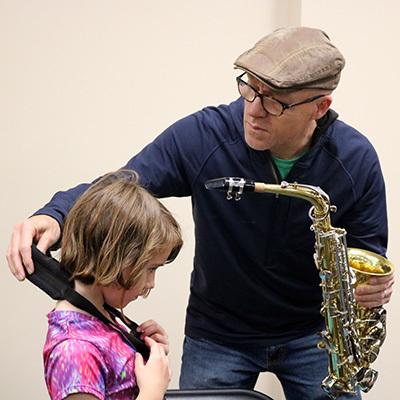 This partnership has been going on for more than 40 years, so if you grew up in Washington, you may remember the day when Ted Brown Music came to your school to show off all the instruments. 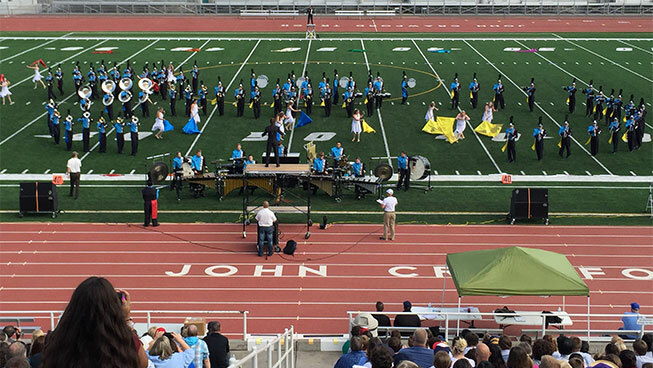 This month, we wanted to take a little time to talk about what happens at these spring band and orchestra recruitment assemblies so when your student comes home and out of nowhere declares “I want to play the trumpet!” you’ll have an idea of why. The developing mind is constantly in motion, so simply telling a student that something new like playing an instrument is fun and easy quickly goes in one ear and out the other. Instead, most students learn best by actually doing something with their hands. For that reason, we meet them where they are – in their school. 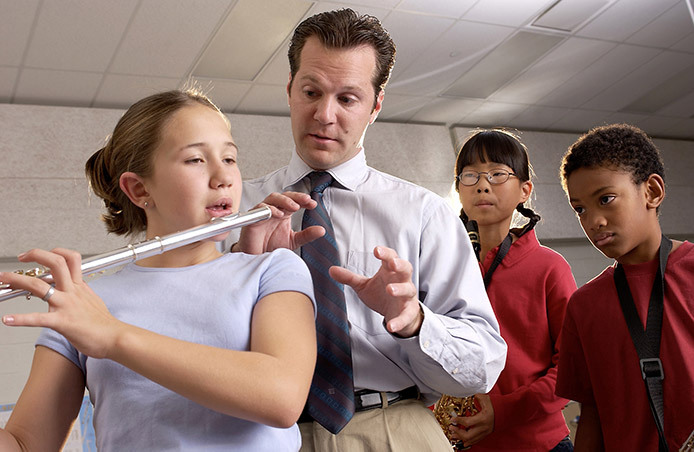 Every student in the grade immediately prior to the start of band or orchestra gets to try an instrument, whether they want to or not. That typically means 4th grade, but it varies. We start off by demonstrating each of the main band and, where available, orchestra instruments. Next, each student gets to try one or two of their favorites. We want everyone to get their hands on an instrument regardless of their initial impression. New things can be scary, but our one-on-one approach sets each student up for success. These kids usually haven’t fallen head-over-heels for music yet. They’re just starting out after all! So they typically have some concerns – mostly pertaining to after school sports and other competing elective classes. Let’s cover some of the more common questions from students. Q: Do I have to pick between music and sports? A: Almost every school district is set up to have beginning band and orchestra as a class during the school day. In the rare case they don’t, second year music and beyond are during the school day, so a student saying “I can’t play music because I’m going to play football” is exactly like saying “I can’t take math class because I’m going to play football.” It just doesn’t work that way. Even in high school, if a student is on the basketball or football team and the band is playing in the stands, the student would go play the sport. Band directors and coaches are accustomed to these arrangements. Q: I heard I should take a technology class instead of band. Is that true? A: S.T.E.M. is all the rage in schools right now, and for good reason. These skills are increasing in demand every year. However, there is an alternate acronym we should all consider, S.T.E.A.M. (Science, Technology, Engineering, ARTS, and Math), which places an equal emphasis on the Arts. The arts are just as important to a student’s emotional and intellectual development. The arts are what make us human and they make us stand out as individuals, no matter the career path. Studying the arts, not necessarily as a career but as a means of enriching our lives, is what gives us the ability to think outside the box and to do things in a way that has never been done before. When you think of Seattle, you think of the Space Needle. Why? Because it’s unique. Engineering may be an aspect of S.T.E.A.M., but the ability to create something original is fostered by the arts. Q: Can’t I just start band later? A: Just about every other elective is set up for students to jump in at any time all the way through high school. But not band and orchestra. These classes are continuous, meaning skills grow year after year based on what was learned the year before. Because of this, the best approach is to start beginning band or orchestra to see how you like it. Students can stop playing whenever they want, but if they waited until 7th or 8th grade to give it a try, they will be starting years behind, and will have difficulty catching up. Q: What if I don’t have time to practice? A: Band is a class and it does have homework. “I don’t have time to practice” is like saying “I don’t have time to do my history homework.” That being said, in the first year of playing, 10 to 15 minutes of practice every day is all you need. Often, 10 or 15 minutes naturally develops into 30 to 60 minutes or more over the years, but it starts with consistent practice early on. Like with everything, you get out of music what you put into it. But if you start too stringently, you run the risk of burnout. If you force your student to practice 30 minutes every day, they will think of music as a chore and might not want to continue. Ten minutes a day for the first three months is plenty of time to get a handle on the basics. Twenty minutes for the rest of the first year will ensure they continue to grow without taking on too much at once. Q: My older brother got to go to Disneyland. Will I get to do that too? A: Ask anyone that plays and they will tell you that one of the coolest parts about playing music are the fun opportunities it provides. Many high schools go on overnight trips every year for contests and tours. In addition, a lot of them have a major trip every three or four years. 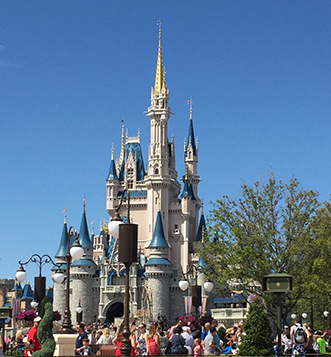 The Disney trip is a favorite because, well, it’s Disney! But besides that, school music programs are given the opportunity to see what it’s like to be a professional musician in the Disney Orchestra. They play on the same stage surrounded by microphones and record tracks to a movie the same way the pros do. Some students get to go to Washington DC, others get to go to Europe. There is no limit as to what you can do or where music can take you. Give Your Child the Chance to Make Music! If your student hasn’t yet signed up for a school music program, please consider it. School music isn’t just for kids who want to be professional musicians, though there are a few of those. School music gives kids the opportunity to see a world beyond what they know. If your children aren’t old enough yet, start talking to them now. If you play, let them see you practice. Let them touch your instrument. If you aren’t a musician, consider early piano lessons, or just show them videos of people playing. If your student is too old to join beginning band or orchestra, consider private lessons or talk to them about joining choir. Maybe just buy them a guitar or ukulele for Christmas. Or maybe you’re thinking that you yourself have missed the boat? You haven’t. Music is a lifelong endeavor and you are never too old to get started. People well into their 90’s still play every day, so if they can, so can you.